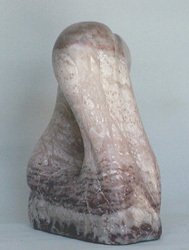 Kai is one of the Motion Series of sculptures. It joins other sculptures that include: Embark, Hansou, Kinpaku, Mizushou, Momentum, Motion, Nami 2, Oonami, Precipice, Skating, Soushi, Soushi2, Triptych, Ugokasu, Ukei, and Uzushio. .
Kai is a very quiet meditative sculpture. It has a very gentle sway that conveys that calm. Kai i is closely related to Motion, Nami 2, and Precipice. 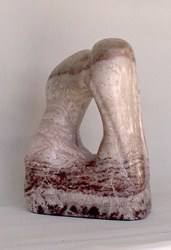 Movement is an unusual activity to catch in stone. 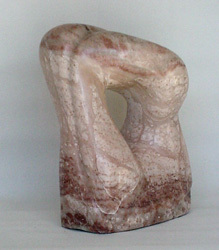 Stone Sculpture is noted for being solid, rooted to the ground, and unchanging. Exploring unanticipated action is the common feature of the Motion Series. 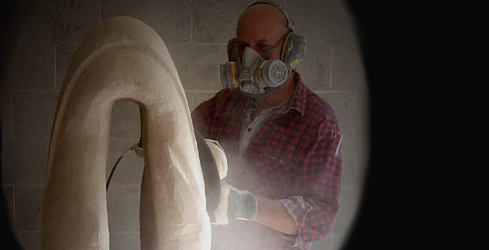 A sculpture caught in the act of falling, another sculpture caught just before it is ready to leap off its' base, another seemingly moving effortlessly across its' base. All of these are displaying that elusive stone quality - movement.